I tried to indulge and sleep in today knowing we were to be picked up around 11am, but my natural alarm went off early and I managed to hold off until 6:30 when I had to get out to pee. It was pretty cold, and as suspected, everything was covered in frost. I had propped my open umbrella in the vestibule for added warmth (it works!) and when I closed it, it had to be peeled away from the tent doors it had frozen to. When I opened my tent door, it was like an actual swinging door of cardboard. I returned and spent the morning in my tent blogging and waiting for the sun to reach me. E kept busy and was motivated to get up and move all her things to the sun in the road to dry out. I had no motivation for that. 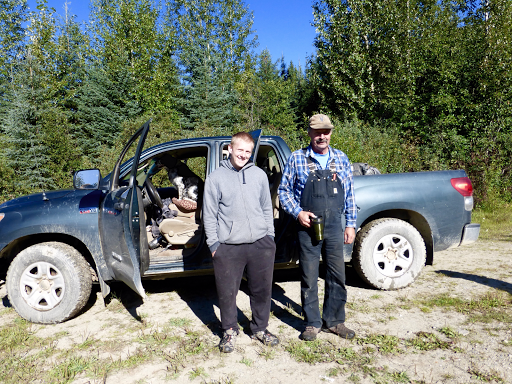 While she was packing up, Guy, the trapper we met last night, and his nephew Michael drove up. Turns out they were headed out and lived just 5 minutes from where our hosts Pete and Carol lived in Prince George four hours away. What a coincidence! Guy was willing to take us out as far as we needed, so we packed up quick and jumped in the truck. Sweet! It was a very informative ride as Guy knew this area like the back of his hand and has been a trapper out here for what must be decades. We saw our second bear of the trip in a car again! It was a small black bear we think and it was on the road and ran off by the time we got close. Our original ride, Pete and Carol, were already halfway down the rough Walker Creek Road, which was a two hour drive each way. 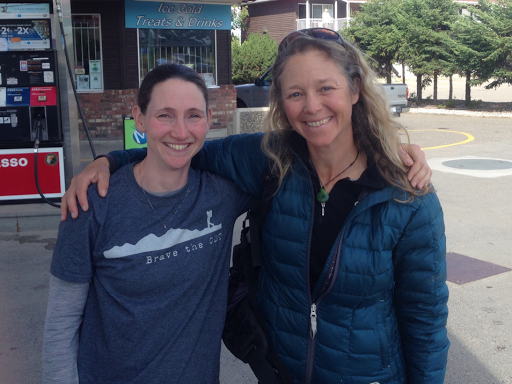 I messaged them on the InReach and we eventually ended up deciding that they could just turn around and head home and we’d meet them back in Prince George. It saved them two hours of driving today, but made for a six hour drive that they ended up not needing to make, so we felt bad about that. What are the chances that a) any car would be driving out Walker Creek Rd b) that car would be going to our final destination of Prince George four hours away!? Pete and Carol were very understanding and still up for hosting us in Prince George. We made it to Pete & Carol’s in Prince George around 2pm and got a shower for the first time in 8 days and laundry for the first time in 13 days, whew! 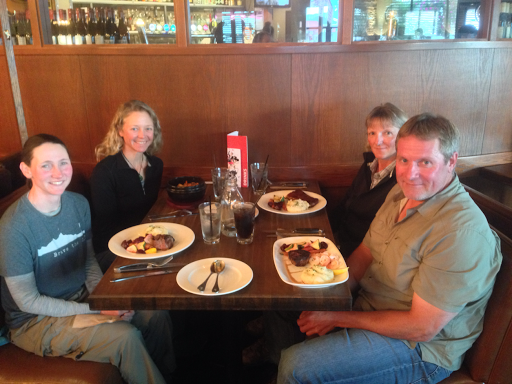 We went out for our celebratory final dinner and it was great! I got steak and E got a rice bowl (crazy vegetarians;P). It is wonderful to have Pete and Carol here to send us off in such a relaxed way. THANK YOU SO MUCH Pete and Carol!!! We’ve said it before, but it was knowing that Pete and Carol would be able to pick us up that allowed us to relax more with miles and do the many high route alternates we did in that final leg. Tomorrow night, I’ll leave to fly to Chicago for a week. 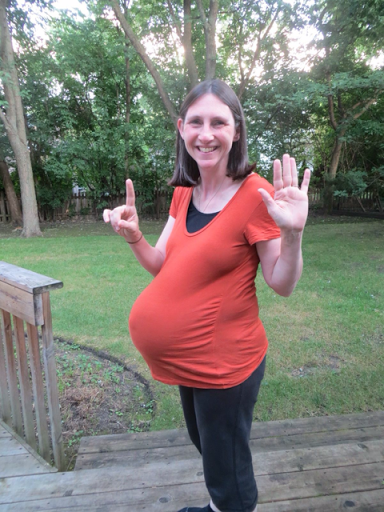 My twin sister is due to have her third son in four days (picture below is with 6 days left to go)! Hold on litte guy! Aunt Erin is on her way! So far, she’s holding on and I’m excited to spend some time with my 2 & 4yr old nephews, who I’m bringing Clif Bars and Kit Kat Chunkies. 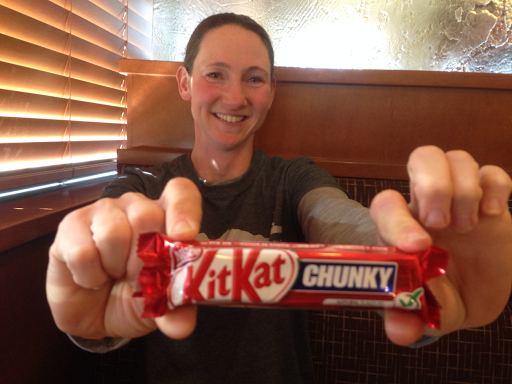 They are quite excited about the Kit Kat Chunkies and I’m having trouble not eating them! I did send them this photo to build the suspense. The Great Divide Trail was one EPIC and AMAZING experience and it’s going to take awhile to really soak it all in. Quite surreal in a way and I’ll surely be doing some post trip reports and advice to future hikers on all the hikes I did this summer. The GDT really was the grand finale I hoped it would be and lived up to all my expectations and more. 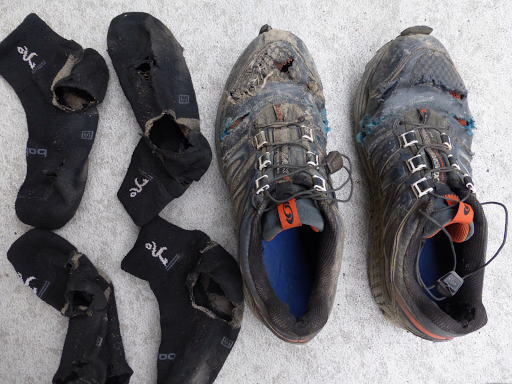 So unbelievable that it really happened…and the shoes and socks made it through! As for plans for future hiking….man, there is so much out there! I keep waiting for the one that is pulling me the strongest and I have a feeling I’ll do something next season. I really have no idea what it will be though, but many possibilities are vague things I’ve heard of and need to look into. I’ve now gone out for at least four months each of the last three years in a row and four out of the last five years. I know it seems like a vacation, but it’s quite tiring and I need time to recharge. The funds and time are there to do more. I just need a bit to step away and see where my gut is with it all. It’s been quite a tiring last five months. Thanks to everyone who virtually came along and those of you that contributed to the moral and sometimes financial support of these hikes! As always, it’s been great to be able to share these journeys with so many people all over the world. As usual, I will be doing my yearly presentations in Portland on both the Hayduke and Great Divide Trails. Mark your calendars as I already have some lined up. Two this year at the Mazamas in Portland. Their full calendar will soon be posted, but I’m booked for the Hayduke presentation Oct 28th and the GDT presentation Jan 6th. I’ll also be presenting at the Trails Club of Oregon’s annual backpacking weekend seminar in the Columbia Gorge Nov 7-8th either one or both trails. Official registration has yet to open. Then I’m sure I’ll be doing some for the Portland area REIs as those are always enjoyable. I’ll be posting them all on my homepage as they are booked and will be sure to send out a reminder. Whew, bye for now everyone!